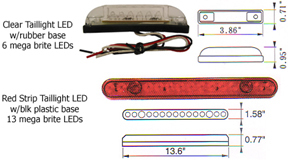 6 LED's in a sealed light bar base for the run/turn forward or mid light on any vehicle. Designed to fit as a custom unit or add to give extra safety. 3 wire connection. Brightest and widest dispersion angle available. Molded in clear plastic lens, sealed water tight, with black removable rubber base. Connect wires to ground, run circuit, and turn circuit, of if no turn needed and to use as auxuallary light, connect just the turn(the brighter) circuit for a center light on trailer, or marker light. Cool euro look and brilliant amber light!! Sold per each light.